If it should be very elegant. Then this midi dirndl in 68cm skirt meets all the dreams of demanding dirndl fans. Colour champagne. This not only fits optimally to Dirndl but the colour name is also program. 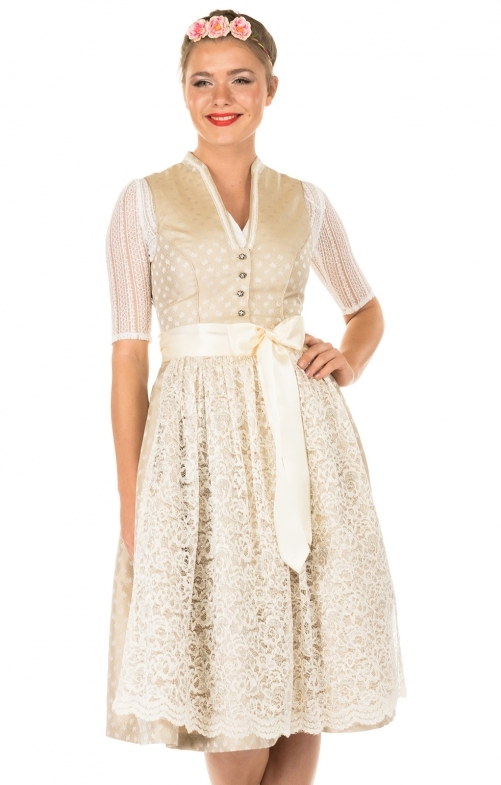 Because champagne should flow when you wear this dirndl. Means: Especially for festive occasions, this short Dirndl is ideal. Also as wedding dirndl makes the model from the Dirndl collection of Marjo costumes outstanding. Fine web jacquard with tone-on-tone floral motifs, which change slightly and are festively sophisticated, depending on how the light comes in. The dirndl is high-necked which fits very well with this elegant Dirndl type and closed at the front with small rose metal buttons. Highlight and eye-catching at the same time is the very elaborate Dirndl apron in high-quality lace. With this exclusive occasion-wear dirndl you will not be able to avoid the compliments.